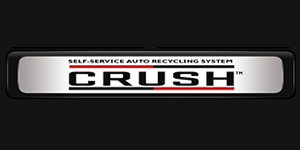 Crush is software to run an automobile recycle yard (or junkyard). The system is used by the recycle yard that hired us to write it and they sell it commercially. This is another company that spent considerable money and time on 2 or 3 previous attempts to get this system developed. They had nothing useful from those attempts so we designed and wrote this system from the ground up. Receiving - Inventory and pay for vehicles sold by customers. CDU - Customers who sell vehicles to the yard are issued a receipt. Customers enter the receipt code at the CDU, an ATM-like machine, to receive cash. The CDU is like a vault for the cash lowering the risk of robbery. It’s bolted to the floor or wall and has alarms, keys, and combination locks. Touch-screen POS - Auto parts don’t have bar codes like most products sold in stores so the touch screen displays categories then products for quick checkout. Prices and sales tax are configured ahead of time. Gift cards can be sold and redeemed and payment methods (cash, check, credit card, debit card) are store configurable. Cashier Auditing - Tracks sales and drawer balance and can report too much or too little collected by the cashier. Cashiers are notified when the drawer’s cash balance reaches the drop amount so the system can track their safe drop amounts. These measures keep cashiers honest and reduce the risk of robbery by keeping register cash amounts low. Commodities Resale - Lots of vehicle parts and scrap metal are sold to other companies as commodities. Commodity buyers come in and take truckloads of the parts they resell. Commodity loads sold are tracked and priced, then invoices can be generated and payments can be credited. Management Dashboard & Reports - Current statistics and reports showing received vehicles and amounts, CDU payouts, CDU outstanding liability, CDU cash balance, commodities sold and amount, commodity payments received, cashier sales, etc. User Sign in & Permissions - Role-based user permissions with “cherry pick” overrides. A user set to the role of Cashier has automatic permissions, but individual permissions can be added or removed.